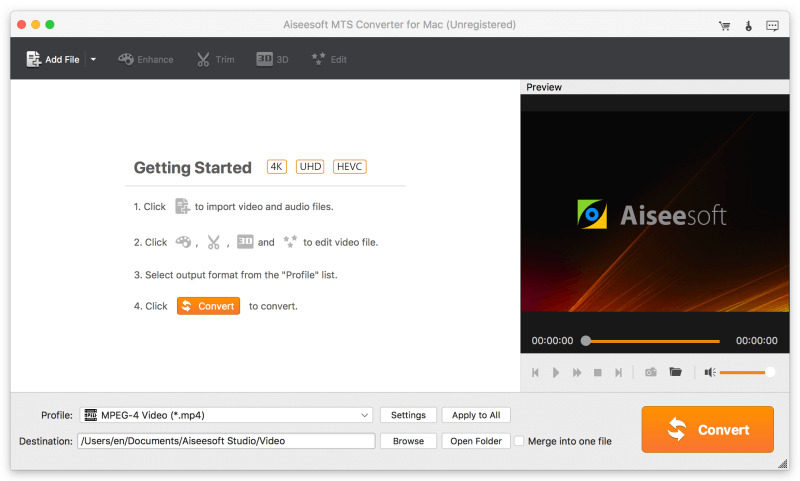 Aiseesoft MTS Converter for Mac 9.2.6 Free Download - Convert MTS and other popular video/audio files to any video or audio format. Aiseesoft MTS Converter for Mac is second to none among various MTS Converter software for Mac users, since it can convert MTS, TS, M2TS, MP4, and other popular video/audio files to any video(AMV, ASF, AVI, DivX, Flash H264, FLV, SWF, H.264 AVI, MKV, DV, MOV, H.264/MPEG-4 AVC, MPEG-1, MPEG-2, MPEG-4, M4V MPEG-4, MTV, VOB, WMV, XviD, VCD, WebM, HD video) and audio(AAC, AC3, AIFF, AMR, AU, FLAC, MP3, M4A, MP2, OGG, WAV, WMA) format. Also it enables you to convert among any two audio files. This Mac MTS Converter can convert MTS video to MPEG, AVI, MP4, WMV, MOV, 3GP, FLV, even the HD video to play on Mac, or portable players. Also, it can extract audio track from MTS video and other videos, then convert them to MP3, MP2, AAC, AC3, WAV, WMA, M4A, RM, RAM, OGG, AU, AIFF, APE, FLAC, NUT audio files. Also convert among the above audios. This perfect software is highly compatible with diverse players, like iPhone 6s/6s Plus/6/5S/5C, iPad mini 3/2, iPod, Apple TV, Android devices, YouTube, Samsung Galaxy Note 5, HTC One X, Kindle Fire HD, Mobile Phones and so on. You can obtain any length of voice clip from source file merely by setting the start and end time or dragging the slider bar. You are also allowed to crop the video play region and remove the boresome black edges with no sweat. What is more, it can meet your need of merging all the files into one. Geting your own personalized video can be easily achieved by adjusting output video Brightness, Contrast, Saturation and Volume. The function of Deinterlacing is to avoid mosaic by converting interlaced video to the progressive one. Statement: First, please download the orginal installation package by clicking the download link. Of course you may also download it from the publisher's website. Using Aiseesoft MTS Converter for Mac crack, key, patch, serial number, registration code, keygen is illegal. The download file hosted at publisher website. We do not provide any download link points to Rapidshare, Hotfile, Depositfiles, Mediafire, Filefactory, etc. or obtained from file sharing programs such as Limewire, Kazaa, Imesh, Ares, BearShare, BitTorrent, WinMX etc. Software piracy is theft. If you like Aiseesoft MTS Converter for Mac please buy it.